Congratulations to Deema F. Allan for a Successful M.Sc. Thesis Defense! The LIINES wants to congratulate Deema F. Allan with a successful defense of her master thesis entitled: “Enhance Electric Vehicle Adoption Scenarios for Abu Dhabi Road Transportation”. Deema joined the LIINES in 2014 to work on transportation electrification. The past two and a half years Deema has progressed the research in the lab incredibly as a result of her admirable dedication and perseverance. We wish Deema all the best in her future work and we are confident that her passion will lead to great achievements. The LIINES is pleased to announce the publication of the journal paper entitled: “Job Creation Potentials and Skill Requirements in PV, CSP, Wind, Water-to-Energy and Energy Efficiency Value Chains” to the journal of Renewable and Sustainable Energy Reviews. This paper was authored by T. M. Sooriyaarachchi, I-Tsung Tsai, Sameh El Khatib, Amro M. Farid and Toufic Mezher. Job creation is a significant outcome of the development and deployment of renewable energy (RE) and energy efficiency (EE) technologies. With the complicated dynamics related to job creation in RE and EE technologies, this paper considers direct, indirect as well as induced employment opportunities resulting from various sustainable energy sectors. This paper explores the factors affecting job creation, existing techniques for establishing the job creation potentials, and the required skill sets in the sustainable energy sectors namely; solar PV power, Concentrated Solar Power (CSP), wind power, waste-to-energy, and energy efficiency measures. In addition, it provides case studies showcasing the variation of job creation in Germany, Spain, the United States, and the Middle Eastern region. Figure 1: This figure represents available jobs within various renewable energy sectors. 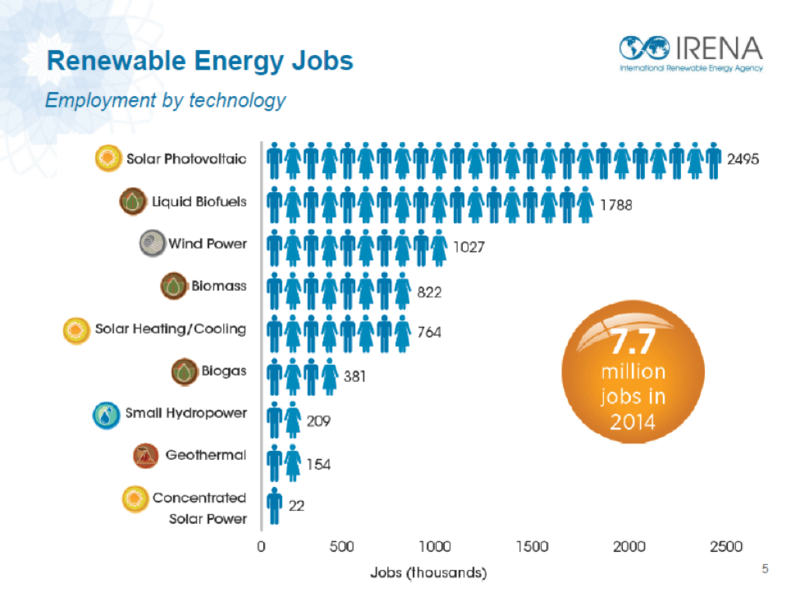 The figure was prepared by the International Renewable Energy Agency (IRENA) for the Renewable Energy and Jobs Annual Review 2015 IRENA Policy Day 9 June, 2015. Note that Solar Photovoltaic is the leading employer in the renewable energy sector. For the RE sector, the study shows that available jobs and required skill sets heavily rely on the technology value chains of the specific industry. A further breakdown of the value chains allows for categorization of these jobs on account of their stability and permanency. On the other hand, jobs within the EE sector fall within educational awareness programs, energy efficient policies and regulations, and energy efficiency retrofitting which includes conducting energy audits and re-designing buildings to apply the necessary energy efficient measures. The Input-Output matrix and Employment factor methods are considered in assessing the gross and net employment impacts of renewable energy deployment. The paper shows that employment factors vary widely based on the region studied, the size of the RE project, and the decomposition of the value chain. In this paper, employment potential is measured based on capacity installed, money invested or number of temporary and permanent jobs created per year. The paper also provides a breakdown of skill types and levels required within the various sustainable energy sectors. Additionally, it outlines reasons for skill gaps within these RE sectors and provides recommendations on how to bridge such gaps. It observes that skill shortages or surpluses occur mainly due to poor coordination between RE development initiatives and skill providers such as educational institutions. Planning ahead within the RE and EE sectors to ensure better coordination is therefore, highly recommended. As for the case studies, it is clear that the PV solar industry is at the forefront of job creation in the RE sector. This article shows the high growth potential of the solar PV industry and thus it’s greater opportunity for job creation. In the United States, energy efficiency strategies are predicted to create more than 4-billion job-years by 2030. Given the renewable energy targets and plans set forth by several countries in the Middle Eastern region, a lot of direct and indirect job opportunities are expected to be created in the coming years. In analyzing the potential of job creation within the RE sectors, the article recognizes that indirect job losses resulting from phasing out fossil fuels, and the increasing electricity prices play a significant role in determining the actual net employment potential of the RE sector. On the other hand, this paper predicts the continued growth in job creation within the EE sector especially given the necessity for energy efficient measures to aid in curbing climate change. Steffi Muhanji is completing her bachelor of engineering degree at Thayer School of Engineering at Dartmouth College. Her research interests are in renewable energy systems and electric microgrids. Steffi will be pursuing her PhD at the Thayer School of Engineering starting this fall with Prof. Amro M. Farid as her research adviser. The LIINES is happy to announce the publication of the paper entitled: “Axiomatic Design Based Human Resources Management for the Enterprise Transformation of the Abu Dhabi Healthcare Labor Pool” to the Journal of Enterprise Transformation. The paper is authored by Prof. Inas Khayal and Prof. Amro M. Farid. 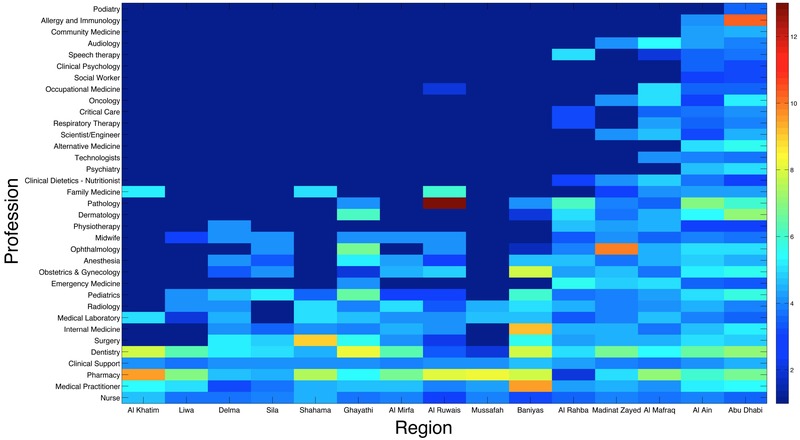 To our knowledge, it’s the first regional-scale multi-decade Big Data Healthcare Human Resources Management Study ever conducted and shows the spatial-distribution of retention and attrition rates of the Abu Dhabi Healthcare System in recent decades. The quality and reliability of a nation’s healthcare system is often driven by the number and diversity of its healthcare professionals. Unfortunately, many developing nations have constrained segments of highly skilled labor and must “import” this human capital. Volatility in key healthcare professions can threaten reliable and sustainable healthcare delivery. This article considers the development of a healthcare human resources sector in a quickly developing nation as an enterprise transformation problem. 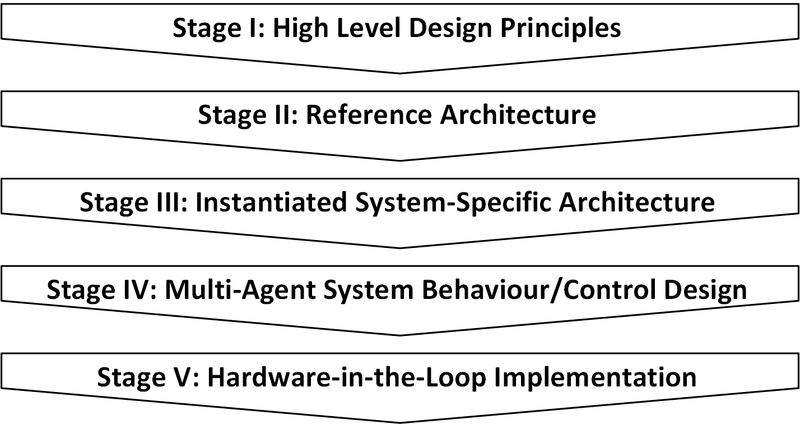 In this article, the axiomatic design large flexible system modeling framework is used to assess healthcare delivery capability in Abu Dhabi, UAE. The Abu Dhabi case study shows significant volatility in the healthcare labor market. 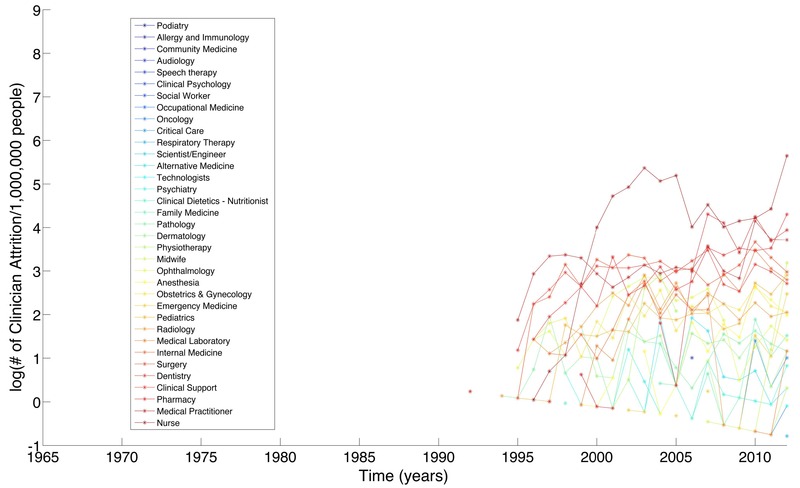 Specifically the evolution of healthcare professional attrition has been on the rise for the last 20 years. This has caused the net evolution of healthcare professionals to be quite variable. The below figure shows the variation of profession types across the different areas with most of the fulfillment only in the cities (Abu Dhabi and Al Ain). 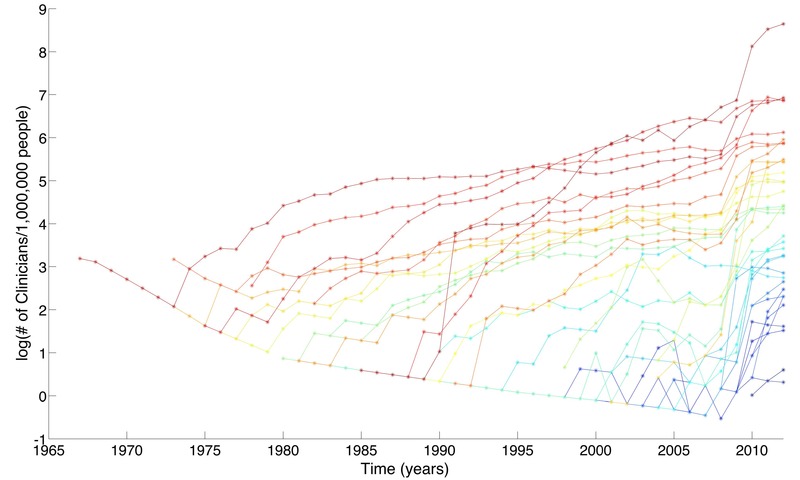 The work demonstrates that the axiomatic design theory as applied to large flexible systems can be applied to data-centric methods in human resources management in the context of skills shortages and high attrition rates. Inas Khayal is an Assistant Professor of Health Policy and Clinical Practice at The Dartmouth Institute within the Geisel School of Medicine at Dartmouth. Her research interests focuses on on developing systems solutions that curb the growth of chronic disease by apply systems engineering tools and techniques to medicine.